Dining at Maso Runch. 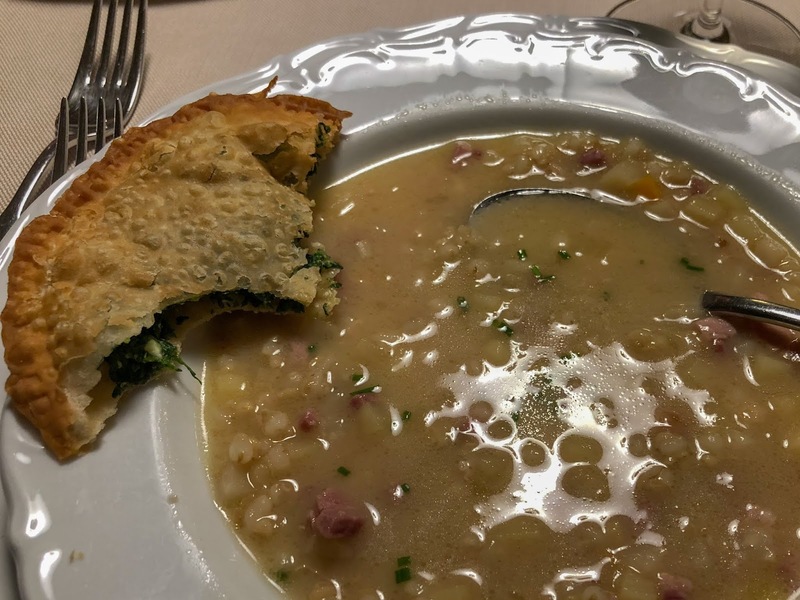 Left: Panicia - barley soup with speck. 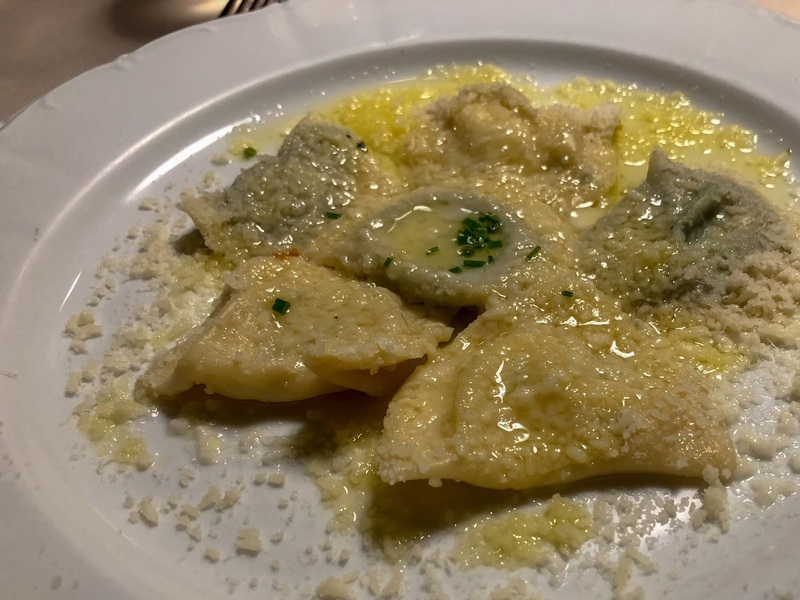 Center: Canci t’ega - spinach and ricotta ravioli, in brown butter. 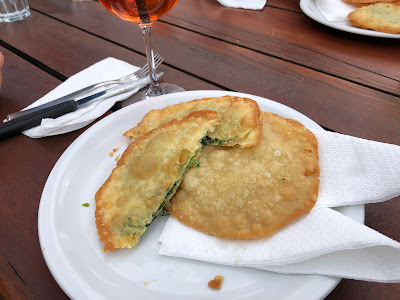 Right: Tutres - fried pasta, stuffed with spinach, ricotta or sauerkraut. Here are places we have tried for dinner in Alta Badia, ordered from places we have visited the most to least. We tend to go back to places we like, so you can interpret the first three recommendations as strong ones. The years we went to each location are in parentheses. 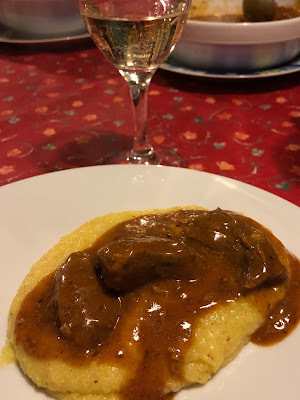 This always seems to be our first night’s meal every time we are Colfosco/Corvara. We stay in the nearby Nature Hotel Garni Delta and it’s a quick walk to Mesoles. 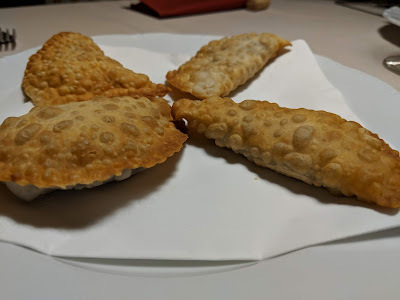 It’s a simple and dependable place with a bit of everything as well as the typical dishes of the region, especially “tutres”. It’s a bit out of the way from Colfosco town center, being halfway between Colfosco and Passo Gardena. I remember our first time there in June 2008, when we got to know the owner, Hilda Alfreider. We chatted late into the evening about the upcoming momentous election in the US. 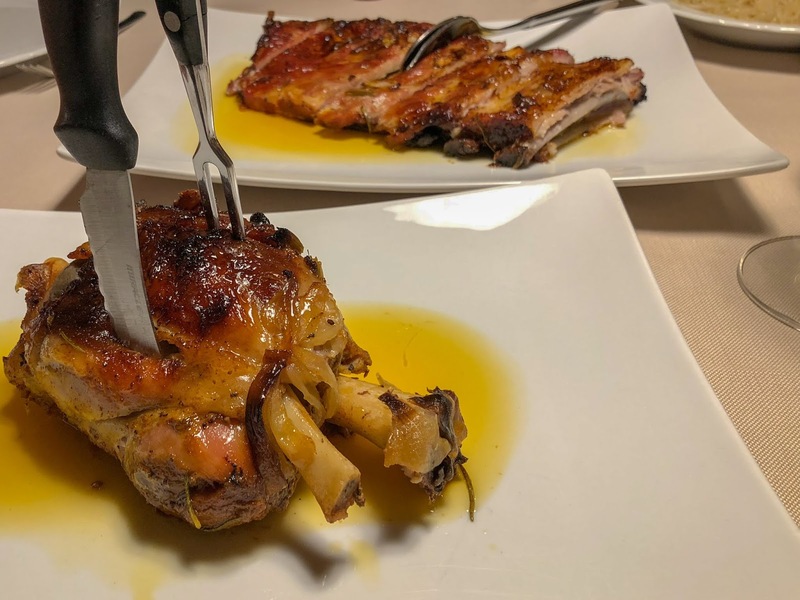 There is a part of the Sella Group – of which this restaurant is practically at the base of on the north side – called in Italian l’altopiano delle Mèsules. I’m guessing the restaurant is named after this but have no idea on the etymology. This is one of our favorite stops for uniqueness of location and Ladin cuisine experience. It’s located above Pedraces (in Badia) and is one of the two Osteria d’Italia Guide recommended places in Val Badia. (We use the Osteria App faithfully. Don’t leave home without it!) Bring your appetite to Maso Runch because you will be served many courses, with options for second, and you won’t want to miss any of them. 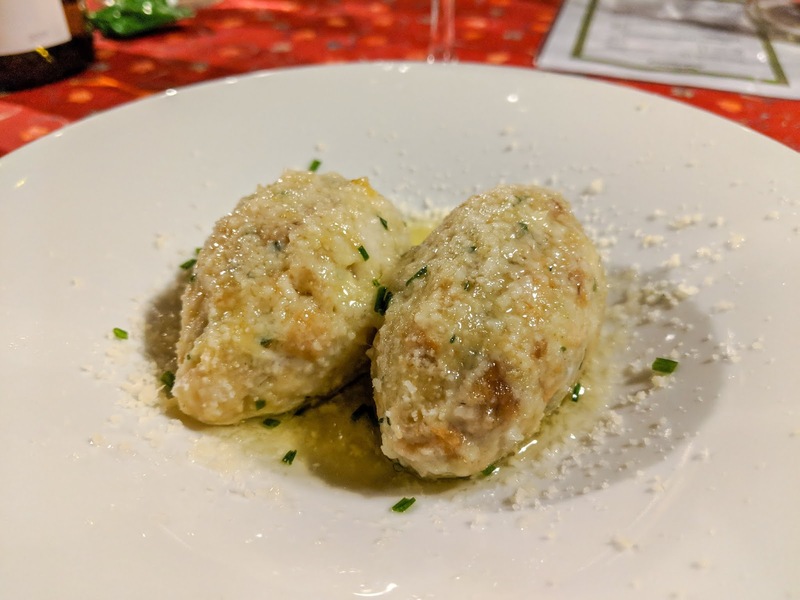 As an example, here's what you might expect for food courses: panicia (an orzo soup), tutres (fried pasta, stuffed with spinach, ricotta or sauerkraut), canci arstis (leavened and fried ravioli with spinach or poppy seeds), canci t’ega (ravioli with spinach with melted butter), giama de purcel cun pulëinta (pork shank), custëis e kraut (pork ribs with sauerkraut), and Bales y golasc o pulëinta y golasc (goulash). A maso is a typical farmhouse of the Alta Badia. 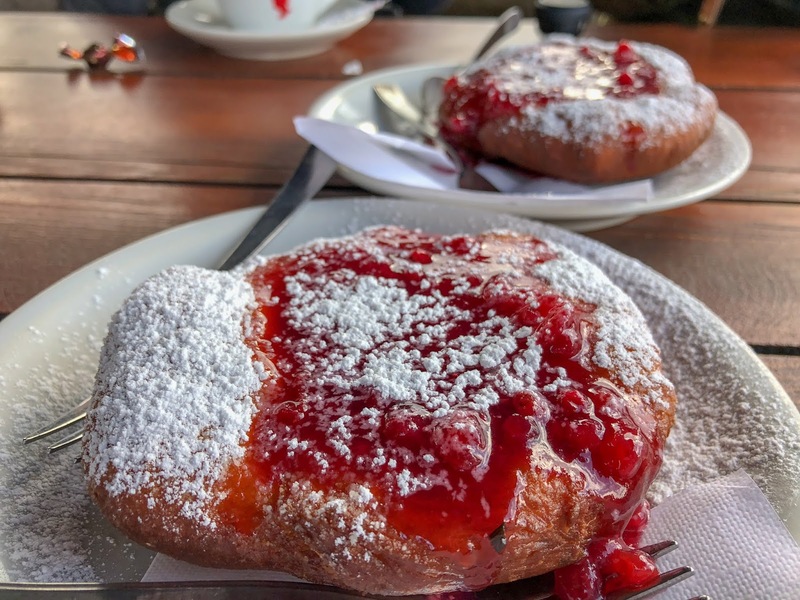 They are very pleasing to look at and in the case Maso Runch you get to eat inside it and experience it through your stomach. Maso Runch has been around for a mere 200 years, and that along makes it worth the visit. Dining at Maso Runch. 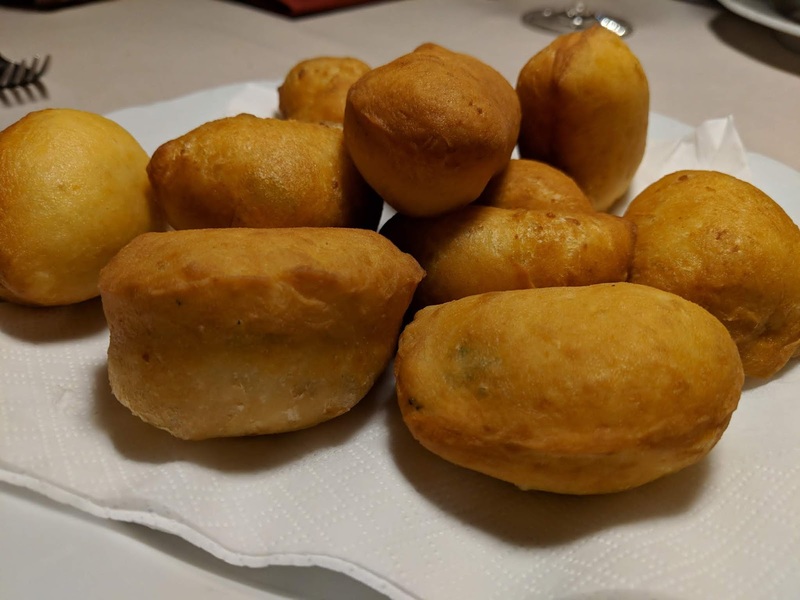 Left: Canci arstis - leavened and fried ravioli with spinach or poppy seeds. Center: Pork shank and ribs. 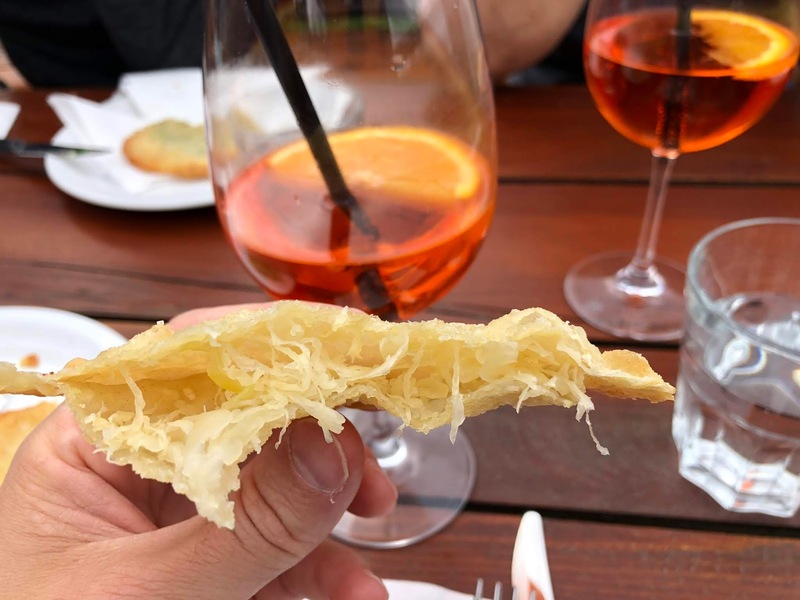 Right: Strudel. This is another Osteria d’Italia pick near Maso Runch but on the opposite side of the valley above Pedraces (in Badia). 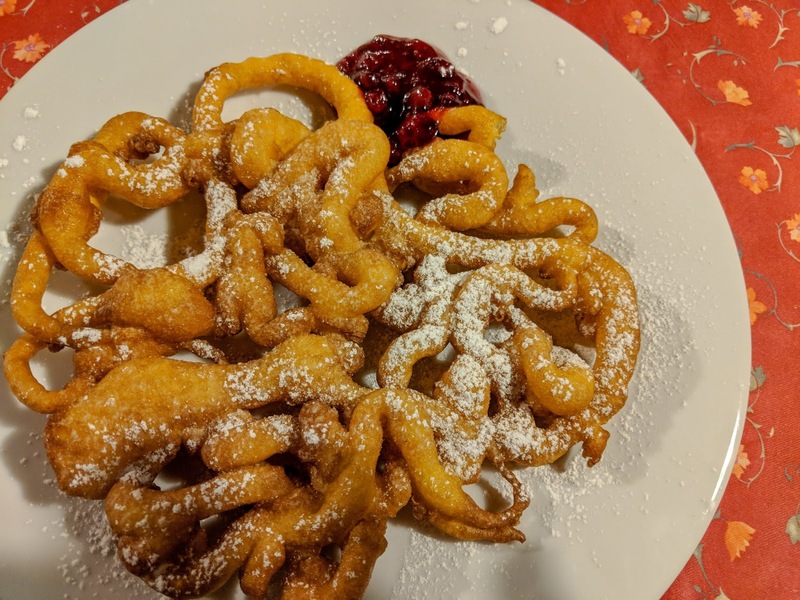 It’s less “fancy” than Maso Runch and significantly smaller, but it makes up for it in a satisfying meal with reasonable food portions and less overall courses that will make it easier for you to say yes to dessert, delicious furtaies. You will get a more personal experience at Sotciastel – at least we have both times we visited. It’s an intimate space with honest cooking. 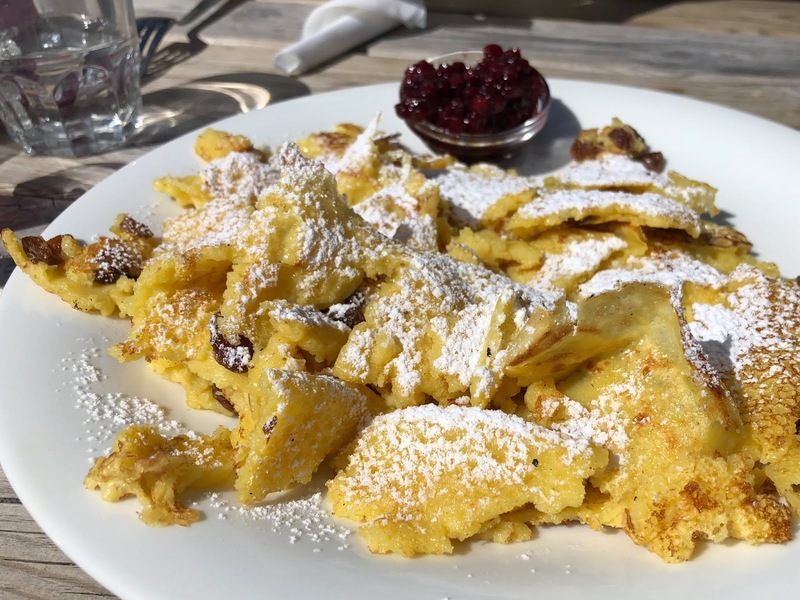 The typically 3 course menu of homemade ladin cuisine is served in the stube in the old house. Stube? It's a wood paneled room (thinking living room) found in many houses of the area. The room usually has one corner given over to a large stove for heating that's fed from outside the room and features benches and beds around it. For more information, see the post Ladin Mugums and Stuas. The name means under (sot in dialect, sotto in Italian) the castle (ciastel in dialect, castello in Italian), with the castle (at one time) being uphill. This maso holds the distinction of being the site of Bronze Age settlements, some of the first permanent settlements in the area. Dinner at Maso Sotciastel. Left: Canerderli browned in butter. Center: Polenta with goulash. Right: Dessert - furtaies (frappe fritte). Located in Corvara in Badia, this pizzeria is at the crossroads of route 243 running east/west connecting Colfosco and Corvara and route 244 running north/south. We've had reliable dinners here. Ristorante Steakhouse L’Fanà Food & Wine (2016) - La Villa, specializes in grilled meat. L’ostì is a new place that we discovered and is a bit on the fancier side. Nature Hotel is where we stay, and we only had dinner there once all these years. Not so much that it's not good, but given we eat breakfast there every morning because we stay there, we like to get out and try other places for dinner. Hiking in 2018, we had lunches at Rifugio Puez, Rifugio Fanes, Ranch da Andrè, and Rifugio Forcella. On our way to Rifugio Fanes, we stopped at Rifugio Gran Fanes for a snack. All rifugi had standard fare with minor variations in menu. But don’t worry, you will never go hungry or suffer from lack of choice at a rifugio. To eat lunch once at a rifugio after a long morning of hiking is like no other experience except maybe eating dinner there because you are staying over night. In 2018, one of our days off from hiking we tried the upscale market-eatery Pur Süditrol in Bruneck (Brunico in Italian) having been praised in a New York Times article 36 Hours in the Dolomites. It was okay for a sandwich, but a bit too sterile for our tastes. Aside: Here we go again. We’ve picked apart the NYT travel piece on Bergamo in our post Perché Bergamo (Why Bergamo)? because that piece represented nothing of what we’ve experienced in Bergamo. And it’s the same with the Dolomites piece: it doesn't match what we’ve experienced in the Dolomites, and think would be practical when visiting. For more analysis on why, see Six Days in Val Badia: Hiking, Walking, and Dining. In 2008, we ate lunch once at Albergo Dasser. We were visiting the nearby Museum Ladin Ciastel De Tor and Dassser made a nice lunch stop. I don’t remember too much about Dasser other than we were a bit rushed being at the end of lunch service. But boy do I remember the museum. It’s one of those weird museum experiences that sticks with you. For more information, see the post Ladin Museum in San Martino. 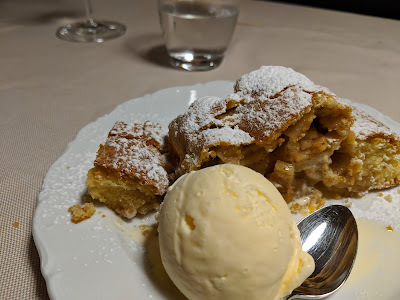 Examples of desserts at a rifugio. Left: Krapfen at Ranch da Andrè. Right: Kaiserschmarrn (Frittata dolce) at Rifugio Puez. Examples of lunches at a rifugio. 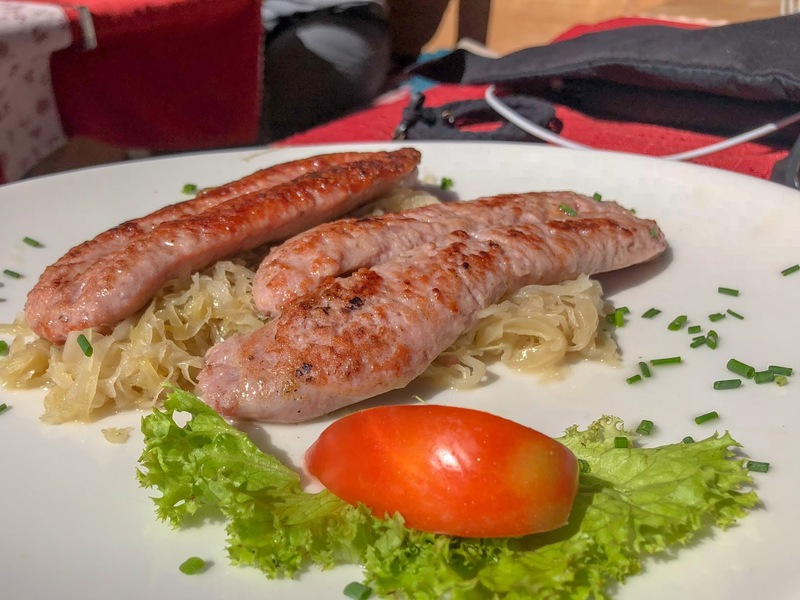 Left: Sausage and sauerkraut at Rifugio Fanes. 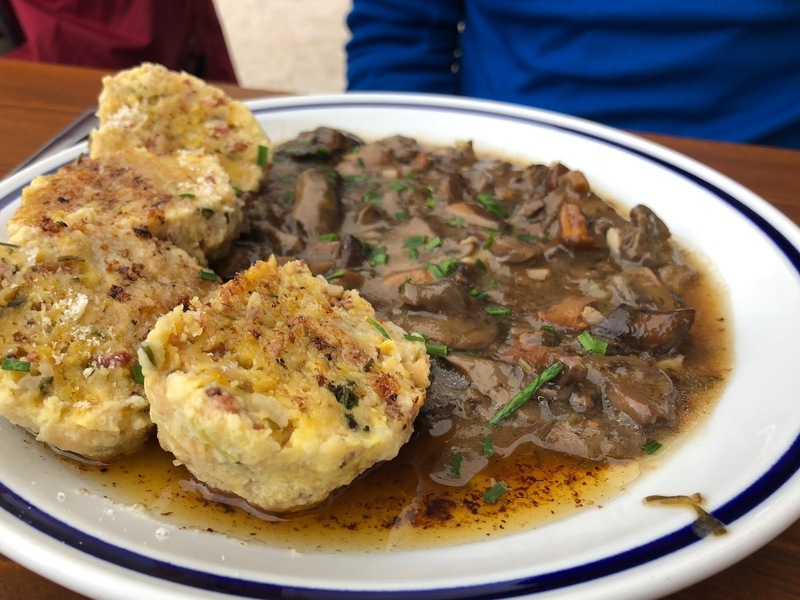 Right: Canerderli with wild mushrooms at Rifugio Forcella Pordoi. Living the life of tutres - a type of fried and lightly stuffed ravioli, here filled with sauerkraut (left) and spinach (right). We had these at Ranch da Andrè.